With digital transactions gaining precedence as the future of payments, POS terminals market is undergoing an enterprising change in the recent times. Over the years, the birth of e-commerce and rising governmental initiatives toward promoting digitization have significantly lowered the risks associated with the traditional modes of payments. Experts speculate this disruptive mix of consumer behavioral changes and government regulations to provide a rather competitive impetus to the overall POS terminals market. For the record, in 2016 alone, the global POS terminals market was pegged at USD 40 billion with worldwide shipments crossing 30 million units. These statistics significantly validate the large-scale adoption of these devices for quick transactions and enhanced consumer experience. Furthermore, as per industry analysts, connected devices and other advanced payment technologies are expected to massively proliferate various end-use industries encompassing healthcare, entertainment, warehouse, retail, and hospitality, which would provide a major boost to the revenue scale of POS terminals industry. However, among these, the retail sector has been witnessing some vibrant advancements over the past few years. Below mentioned is a brief synopsis of how the demand for POS terminals has been leading to the generation of new growth avenues in the retail domain and creating novel opportunities for industry entrants in this space. The retail industry has been the recipient of commendable developments in recent years, owing to the dynamic battle between brick-and-mortar stores and the soaring e-commerce sector. However, a common entity gaining weightage in both these retail platforms is digitization. With the growing trends of digitization and connectivity, modern consumers have been expecting an enhanced shopping and payment experience. These changes are significantly catalyzing the deployment of real-time dashboards that are being used to access and manage devices, transactions, and user profiles. Retail POS systems are not only limited to cash and digital payments, but also provide insights into customer purchasing, inventory management, collection of customer data, and purchase history for effective shopping and speed checkouts. These ongoing developments across the retail payment infrastructure are thus likely to bolster the overall valuation of retail POS terminals market. Given the growing use of credit & debit cards coupled with substantial growth in the e-commerce sector, retail POS terminals industry is all set to grow at an annual rate of 10% over 2017 to 2024. 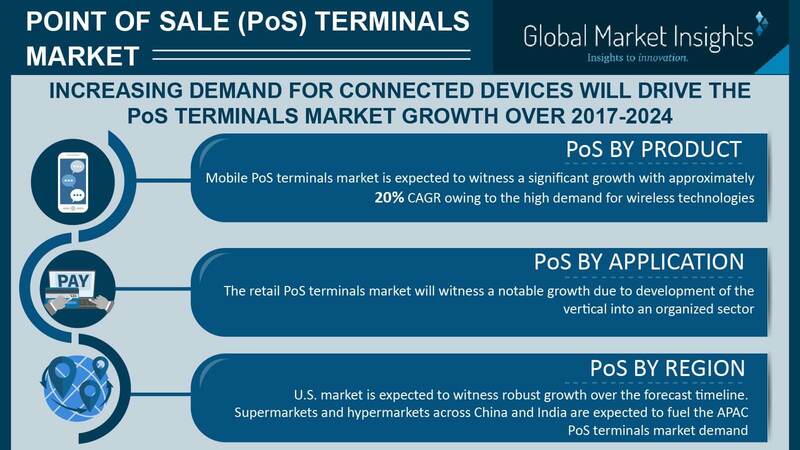 It is vividly coherent that POS terminals industry has a massively huge growth potential in the retail sector, the lucrative scope of which has prompted POS terminals industry giants to invest in this business sphere. For instance, Casio’s investment of millions of dollars in developing and introducing a new android POS terminal for the retail and hospitality industry significantly reflects the fact that the participation of prominent companies is likely to bring about a major disruption in the global POS terminals industry share. Another exclusive instance is that of Toyota and Lexus Financial Services, that have recently launched an in-house electronic POS system titled as the NGage. According to industry experts, this POS terminal system introduced by the automotive giant Toyota for its retail partners, has been one of the significant factors influencing the growth of POS terminals industry in the retail space. Apart from these obvious competitive moves by the industry players, one significant move that has taken the retail POS terminals market by storm is that of the demonetization of the Indian high value currency. This move has practically changed and uplifted the growth opportunities for retail POS terminals industry players. In fact, it wouldn’t be wrong to acknowledge the fact that this move by the Indian government has been a boon to the retail outlets with POS terminals. The demonetization drive by PM Narendra Modi has led to the biggest jump in the digital transactions in India. In the aftermath of demonetization, the demand for POS machines witnessed a sharp surge as the country witnessed a seismic shift from cash to cashless economy. According to reports, after the move, the digital wallet transaction grew almost by four folds in both volume and value compared to the yesteryear estimates. In fact, as per the statistics reported by the Reserve Bank of India (RBI), the number of POS machines in July was recorded over 28 lakhs and was further anticipated to witness a y-o-y growth of 96.7% in the coming years. Thus, it is quite overt to state that amidst the backdrop of this demonetization scenario, India POS terminals market is poised to witness a period of triumph, with major companies establishing strong foothold in the region. Speaking of the massive expansion opportunity for companies engendered by this status quo, another statistical data which holds a valid testament to the growing need of deploying POS machines in India was provided by the Ernst and Young report. According to this report, in 2015, there were only around 693 point of sale terminals per million of overall India’s population, in comparison with other emerging countries alike including Brazil, which had 32,995 point of sale terminals/million population and Russia and China, each of which had around 4000 POS terminals/million people. This data clearly underlines the huge untapped potential in the country and also parallelly indicates the massive scope offered to India POS terminals industry players to index their capabilities and expand their business. Quite openly, the demonetization drive has transformed the overall outlook of the POS terminals market and has depicted a lucrative roadmap for regional as well as global companies such as Verifone, Ingenico, Mswipe, and PAX Technology. Several m-Wallet firms such as Mobikwik, WeChat, Paytm, and Freecharge have also been reported to have gained massive profits through this move that supported cashless economy. An instance bearing testimony to the aforementioned fact is of Mswipe, one of the key players partaking in the mPOS terminals market. The company made it to the headlines by announcing its proposal of deploying more than 50 thousand mPOS terminals by the end of 2017, and by extension, had a subsequent impact on India POS terminals market. mPOS solutions have not only extensively proliferated in India, but have also made huge impact on the global digital transactions. As a matter of fact, according to the 2014 statistics, around 53% of UK retailers rated mPOS as the most important cashless payment technology for consumers. Moreover, in 2015, according to IHL Group, the mPOS software installation were 41% up in North America year to year. Industry analysts speculate the growing demand for digital transactions from the end-use industries such as hospitality and retail to be the major drivers fortifying the overall growth of mobile POS terminals industry. As per reliable reports, the global mPOS terminals market is projected to account a valuation surpassing USD 48 billion by 2023. How are POS terminals industry players contributing toward the expansion of this business sphere? POS terminals industry giants including Verifone Systems Inc., Ingenico Group, Toshiba Corporation, NCR Corporation, Hewlett-Packard Company, Samsung Electronics Co., Panasonic Corporation, and PAX Technology Inc., have been actively vying up with one another to bring technological innovations at the forefront and make most of the changing face of payment options. Verifone, for instance, has recently unveiled two new POS terminals systems that are meant for on-the-go business. These new portable and mPOS products launched by the company are equipped with high quality integrated printer for quick receipts and are proving to be just apt for curbside service, line-busting, and pay-at-the-table. Apart from product innovation, the company has also collaborated with Payworks – a leading infrastructure provider in POS terminals industry. Through this extended partnership, industry experts predict that the joint entity will be further potent to integrate POS terminals systems. Another instance is that of Ingenico Group, a French payments provider, that has recently made it to the headlines for acquiring a Taiwan based value added seller – Airlink. For the record, Airlink offers customized payment solutions such as the POS terminals, software, and field services to retailers and other end-users. Experts believe that this acquisition is further likely to consolidate Ingenico’s position in Northeast Asia POS terminals industry by taking advantage of Airlink’s strong influence on local banks, merchants, and acquirers. These competitive instances quite vividly highlight the fact that POS terminal manufacturers, retailers, and other participants are already enmeshed in the process of laying a concrete foundation for digital payments in the future. In fact, it wouldn’t be wrong to quote that the new mode of digital payments brought forth by POS terminals industry players has significantly revolutionized the traditional payment approach. In effect, industry experts anticipate this implementation of advanced payment mode that is practically disrupting every industry vertical to bring about a revolutionized transformation in POS terminals industry outlook. It comes as no surprise indeed, that global POS terminals industry size has been estimated to surpass a valuation of over USD 125 billion by 2024.